1- Human insulins are effective as insulin analogues. 2- Rapid acting insulins could be administered before, during or after eating. 3- Insulin analogues showed lower risk of hypoglycemia. 4- Bed time NPH (Neutral Protamine Hagedorn)should be given after 11 pm to avoid nocturnal hypoglycemia and smogyi phenomenon. Brand names include Humulin N, Novolin N, Novolin NPH, Gensulin N, SciLin N, Insulatard, and NPH Iletin II. NPH insulin, also known as isophane insulin, is an intermediate–acting insulin given to help control blood sugar levels in people with diabetes. It is used by injection under the skin (SC) once to twice a day. Onset of effects is typically in 90 minutes and they last for 24 hours. It has an intermediate duration of action, meaning longer than that of regular and rapid-acting insulin, and shorter than long acting insulins (ultralente, glargine or detemir). An insulin analog is an altered form of insulin, different from any occurring in nature, but still available to the human body for performing the same action as human insulin in terms of glycemic control. Through genetic engineering of the underlying DNA, the amino acid sequence of insulin can be changed to alter its ADME (absorption, distribution, metabolism, and excretion) characteristics. Officially, the U.S. Food and Drug Administration (FDA) refers to these as "insulin receptor ligands", although they are more commonly referred to as insulin analogs. The Somogyi effect can occur any time you or your child has extra insulin in the body. To sort out whether an early morning high blood sugar level is caused by the dawn phenomenon or Somogyi effect, check blood sugar levels at bedtime, around 2 a.m. to 3 a.m., and at your normal wake-up time for several nights. I*Insulin analogs have a more predictable absorption and action profile in addition to less pharmacokinetic fluctuation in patients with renal insufficiency. How do you manage a pt. in hospital? 5. Insulin infusion should be used to control hyperglycemia in the majority of critically ill patients in the ICU setting, with a starting threshold of no higher than 180 mg/Dl. 6. Once IV insulin therapy has been initiated in a critically ill patients, the glucose level should be maintained between 140 and 180 mg/dL. 7. In the treatment of hyperglycemia in critically ill patients, targets lower that 110 mg/dl are not recommended. • If BG >180 mg/dl and not decreased by 15%, increase by 0.01. • If BG <140 mg/dl, decrease by 0.01. • If BG 140 to 180 mg/dl or decreased by 15%, no change in multiplier. according to the following equation = (100 – BG) x 0.4. 13. Withhold all other diabetes medication during VRIII. 14. Always avoid i.v insulin if the patient is eating and drinking normally. 15. All patients with type 1 and type 2 diabetes should be transitioned to scheduled SC insulin therapy from IV insulin. 16. Patients without a history of diabetes, who have hyperglycemia requiring more than 2 units of IV insulin per hour, should be transitioned to scheduled SC insulin therapy. How do you transfere pt to s/c? Ordering 50% of TDD (Total Daily Dose) as basal insulin and the other 50% of TDD as mealtime insulin divided equally into 3 mealtime doses. Glucose targets were reached in the majority of patients in the basal bolus intervention group with minimal hypoglycemia. Is at a stable tubefeeding rate. 17. 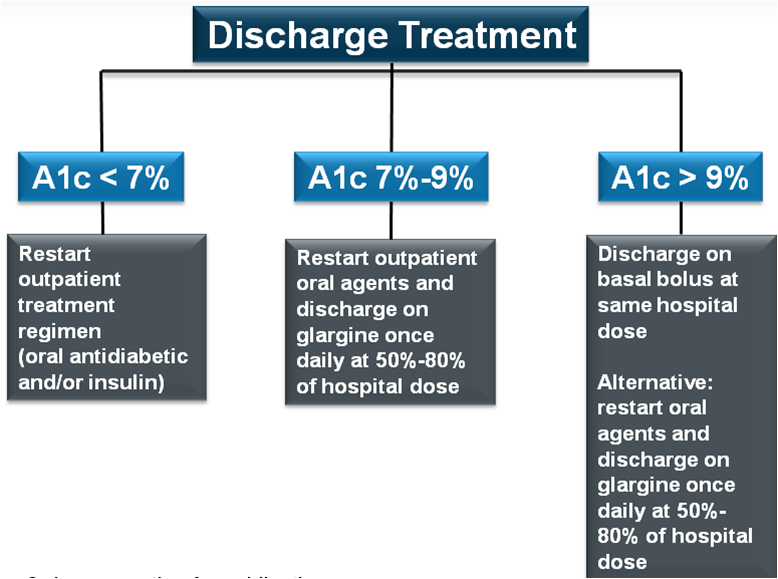 Basal bolus regimen is the recommend regimen to use for shifting from IV insulin to SC insulin. A basal-bolus routine involves taking a longer acting form of insulin to keep blood glucose levels stable through periods of fasting and separate injections of shorter acting insulin to prevent rises in blood glucose levels resulting from meals. What is a short acting bolus insulin? What are the types of basal insulin? Is basal insulin Long acting? When should I take bolus insulin? preceding 6- to 8-hour period to a 24-hour period. • Dividing the total daily dose as a combination of basal and bolus insulin has been demonstrated to be safe and efficacious in medically ill patients. ** In many studies the total daily dose of insulin (TDD)was calculated by multiplying the patient weight in kilograms by either 0.4 or 0.5 units/kg. For all non-critically ill patients, a basal/bolus insulin regimen is the preferred method of glycaemic control. During illness, basal insulin requirements rise with any physical stress, including surgery, infection, infarction, or fever. Basal insulin suppresses hepatic glucose efflux between meals and overnight. Laboratory analysis of plasma is the best means of measuring blood glucose levels, but this approach is too slow for use in the ICU.